Implementing change is difficult. 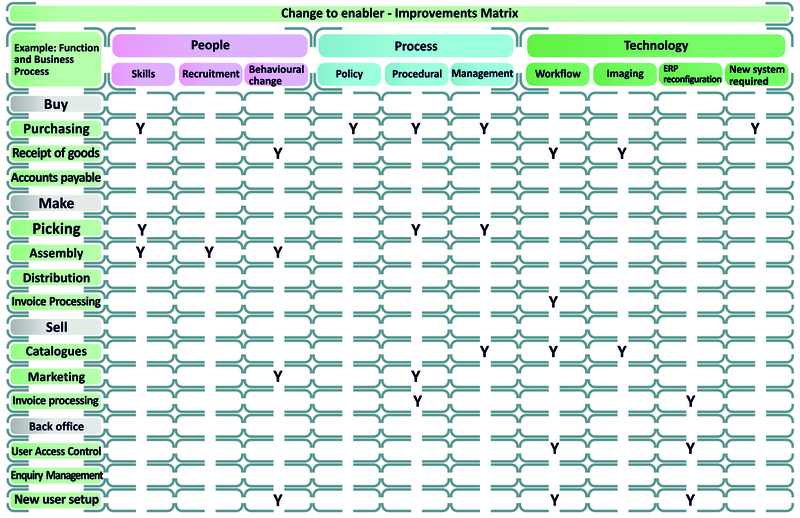 Implementing change without a methodology is very difficult. This article will discuss the basics and provide a structure to guide your projects. It will have sufficient detail to be a stand-alone article, but when used in conjunction with the other content from my blog, it will definitely come alive and you will have all the models and structure you need to deliver a successful business improvement project. The methodology comprises seven steps. It is important to note that while they are broadly sequential in nature, it is common for two or more steps to be tackled concurrently. This is particularly true for steps 4a and 4b. Step 1: Agree project plan, scope and benefits. This is a crucial step in successfully establishing a project. Taking the time to get it right will provide a positive return on investment through minimising scrap, rework and failure. Depending on the author and company, additional headers may be included such as budget, success measures, related projects, and a methodology for handling change requests. Traditionally the project manager is asked to prepare the SOW and the document is then presented to the project sponsor and other stakeholders who review and approve it. The biggest issue with this approach is that the focus is always on the document rather than what it represents; and it is typically always written in a hurry, often within a week. The sponsor reads the document and validates that all the information you would expect to see is there and that the timeline and budget are within bounds of acceptability and then accepts the document. 1. Is there a common understanding of the project purpose? Even if there is a purpose statement, does everybody interpret it the same way? 2. Is there agreement on what success looks like? 3. Does each stakeholder understand and accept what is expected from them throughout the course of the project and more importantly, after the project? 4. Is the risk table complete? Does it include project and business risks? Are the mitigation strategies considered practical or are they merely a cut-and-paste from the last statement of work? 5. How will risks be managed? Merely writing them into the SOW is not managing them. 6. Is the change management plan aligned to the risk plan? 7. Does the resource plan make sense? 8. Does the budget have contingency? How is it calculated? The sponsor should allow ample time for this workshop. The desired outcome is confidence that the project is considered and that the stakeholders are fully enlisted in the project. Not just engaged, but enlisted. That is, they are fully and actively committed to its success. Step 2: Establish project governance. The due diligence workshop is the first activity in establishing active project governance. Governance is the active mitigation of risk through the proactive management of compliance and performance. Merely to be in business requires the acceptance of a degree of risk. This is no different when embarking on a business improvement project. Good governance requires the establishment of a hierarchy of committees to manage the project. I have covered these committees in detail in other articles so I will be brief here. 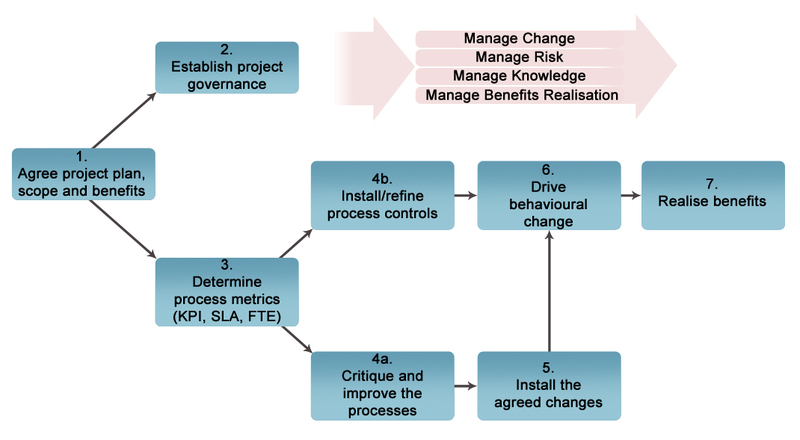 The phrase “change management” is freely used on all projects. The reverse, “the management of change,” is not. There is an important distinction between the two concepts and it is oft-times overlooked. Frequently committee members will attend project meetings, participate in discussions, and then mentally park the project in the back of their mind until the next meeting rolls around. They forget that their role is the active management of change and this requires a substantially higher level of involvement than merely attending a weekly project review meeting. 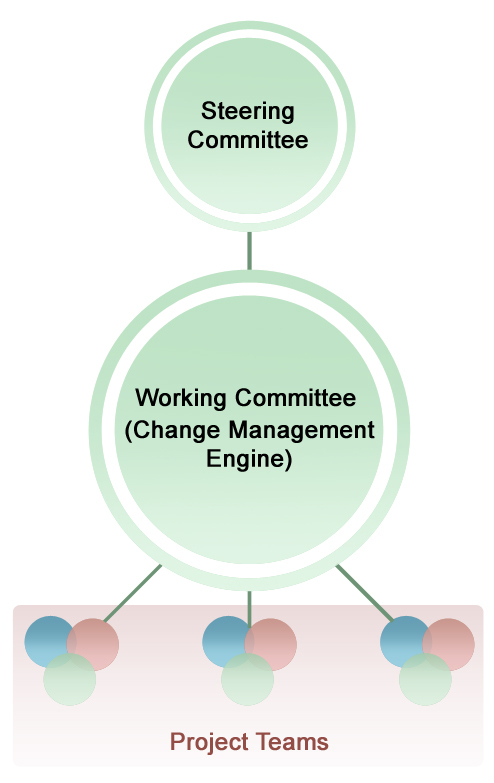 I suggest that change is managed through a three-tier structure. The steering committee is a group of senior managers responsible for ensuring the overall change program stays on strategy. A key point is that there should only be one steering committee. They are specifically responsible for steps 1 and 7. The working committee is responsible for driving the tactical change initiatives. There may be two or more working committees depending on the size of the company and the breadth of change. The working committee is specifically responsible for step 6. By comparison, the steering committee is to ensure that the working committees output will meet and promote the company strategy. Both committees can manage risk, budget, and change, the difference being the scope of authority. The project teams are responsible for the day-to-day delivery of the project activities represented by steps 3, 4 and 5. A common mistake is treating the project committee as the working committee. Step 3: Determine process metrics. The purpose of step 3 is to collect and analyse primary data. 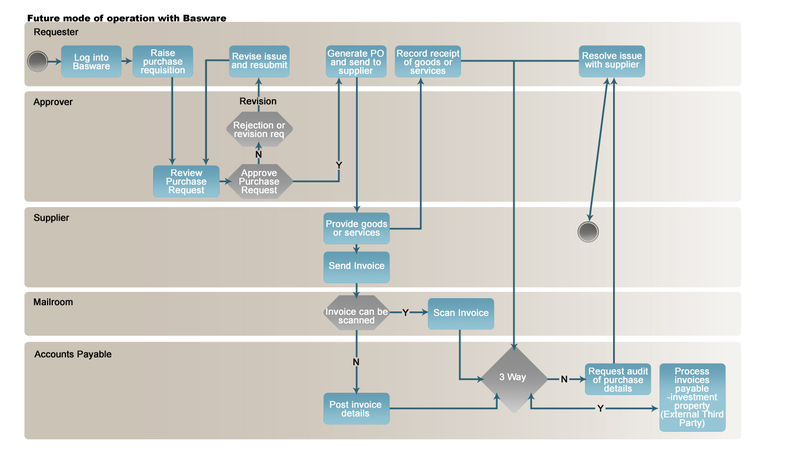 Typically this step involves mapping business processes. 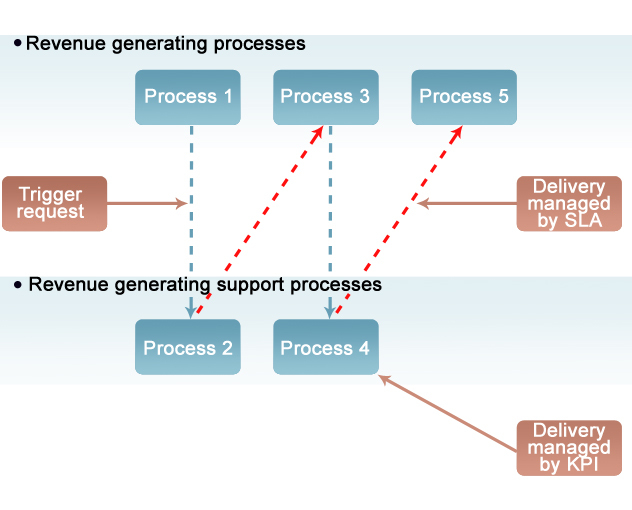 In the methodology, this step is termed “determine process metrics.” This is an important label in the sense it does not say “business process mapping” as is frequently the case with business improvement methodologies. The essence of this distinction is that it is equally or more important to understand the metrics behind the process than it is to understand the process itself. 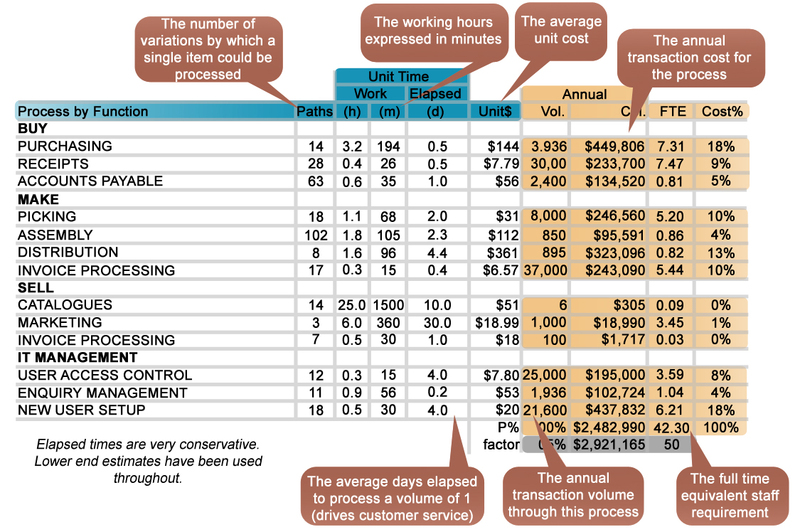 A methodology to calculate these metrics is covered in the article on process reengineering. These metrics should be seen in the context of the unit of measure for the process. This step could produce a table as shown. In terms of benefits realisation, this table can be used to calculate the benefits and priority of the change to be addressed in step 4a. Step 4a: Critique and improve the process. 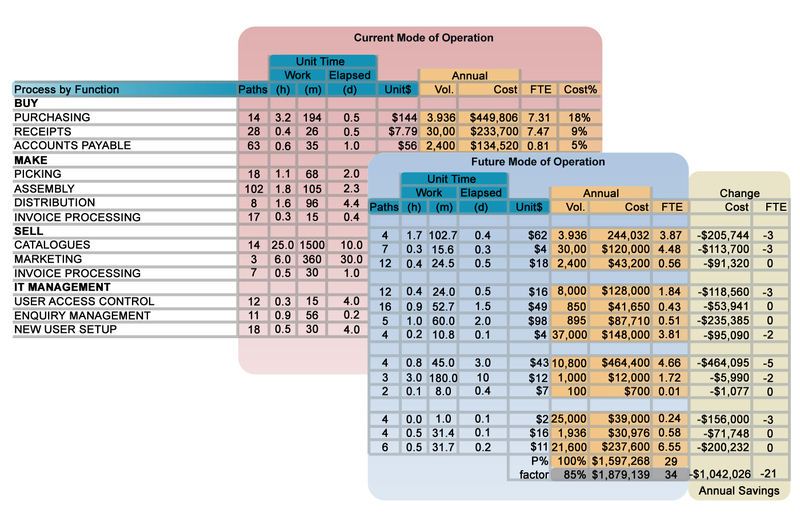 Once you have established the process flows and associated metrics for the current mode of operation, you are in a position to determine improvements to the processes. The data will guide the analysis and quantify the benefits of change. Without this data, it is difficult to confirm that any of the recommendations tabled will result in a substantial improvement. Different is not an improvement. Business improvements can be achieved from changes associated with people, process or technology and any of their sub-components. The following table illustrates the primary sources of change. Frequently improvement requires changes to more than one component. Once you have worked out your business improvement strategies, you can quantify the benefits of change by determining the impact of the change on the same base data set from step 3. The results can be tabled as follows. Step 4b: Install refined process controls. The problem with “businesses” and “processes” is that they don’t exist, or at least, they only exist in the abstract, as concepts. Fundamentally, businesses are groups of people working together towards a common objective and processes are the habitual routines they follow to “process” the demand customers place on the company. To change a process requires changing the familiar routines people follow in their daily behaviour. 4b the focus is to review and reengineer the measures (KPI’s) used to manage the processes. 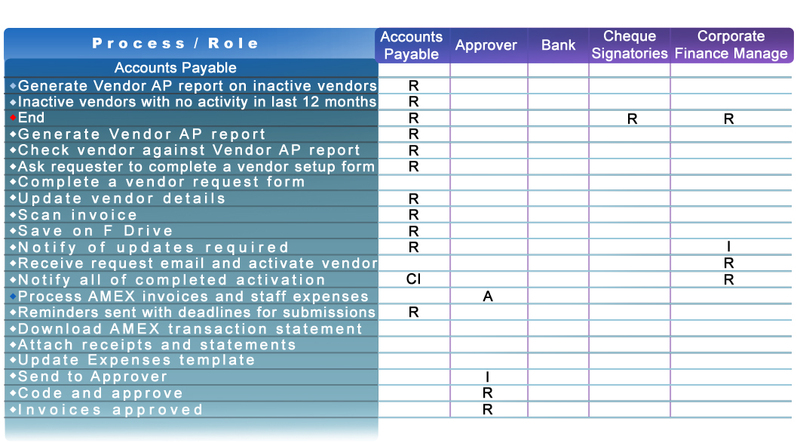 Frequently there is no need to change the activity sequence (business process) as it is efficient. 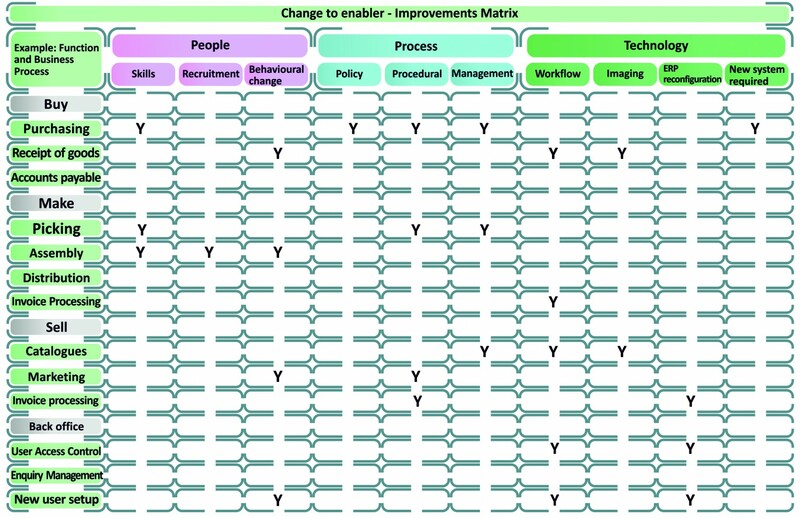 Rather change is required in the behaviours associated with the activity sequence in order to remove productivity issues such as pacing and “territory disputes.” This change can be achieved, in part or in full, through changing the way the process is measured. Should the project objective be to specifically review and improve the business processes, then this activity needs to be completed in conjunction with a review of the process measures. This will prevent substantial investment being spent on defining new processes without concurrently establishing the means to drive the necessary behavioural changes. Steps 5 and 6: Install and drive behavioural change. The purpose of these steps is to operationalise the agreed changes. To install change is to change behaviour. Occasionally, changing behaviour is straightforward and happens without difficulty. Frequently this is not the case. To mitigate failure, a project requires effective change management. The primary purpose of change management is to assist the company to migrate from a project environment to “business as usual.” My observation is that change managers often worry more about completing the standard activities of change management such as communication and training plans, than focusing on the primary purpose. 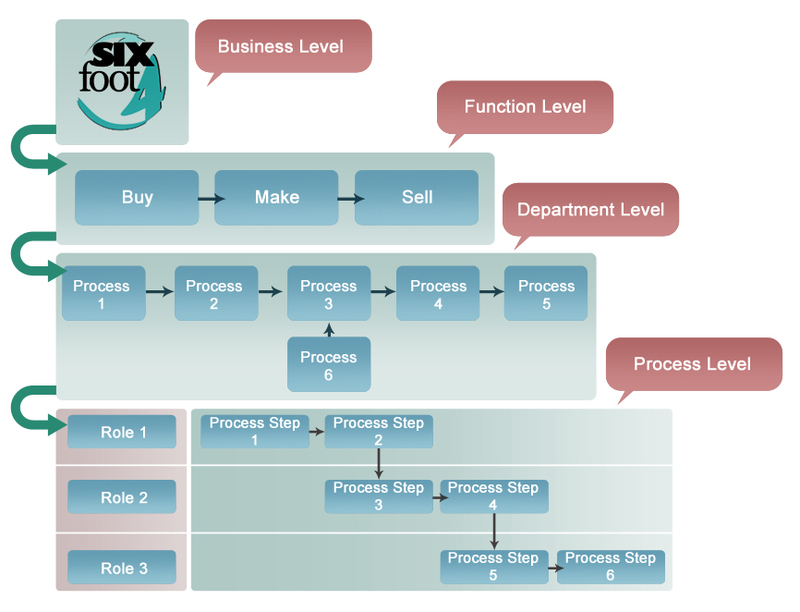 Strict management of the relationship between steps 5 and 6 is crucial for a successful project and moving to step 7. Measurement is mandatory to reach the highest levels of success at this time. There are two areas of measurement. The first is traditional operational KPI’s. These need to be aligned to the future state. This may require changing existing scorecards or even introducing new scorecards. The second area of measurement should be aligned to the change program itself. The change scorecard should include metrics on skills development and staff attitudes. The intent is to measure both axes in the following matrix. Examples are: number of people trained; number and organisational profile of staff communicated to; number and nature of questions received; survey results; and awareness sessions held. This step is the consequence of the prior steps. Success is measured against the business objectives described in the project statement of work and the extended objectives that will have surfaced through the life of the project. An oft-missed aspect of change is the need to be uncompromising. As the project “gets real” and staff members are asked to change their behaviour, the sponsor will come under significant pressure to relax their position on what success looks like. A culture of “close enough is good enough” is typical at this time. The point here is to emphasize that resistance to change is frequently invisible. It manifests itself in perfectly logical and plausible arguments that are all aimed at reducing the scale of change and the benefits realised. The staff making the arguments may not even realise that they are being resistant to change. Mechanical compliance is characterised by instructing staff to follow the new procedures and being intolerant of reasons as to why it can’t be done. As staff become comfortable with the new way of working and establish the new routines of working, they will start to better understand the new order and, if the project has been done well, they will start to see the benefits. They are now at the point of conceptual compliance and once they are comfortable with the benefits of the new procedure they will move to the “utilisation” phase and will own the new way of working. When this happens it can be said that the project has fully migrated to business as usual and the benefits will be realised.